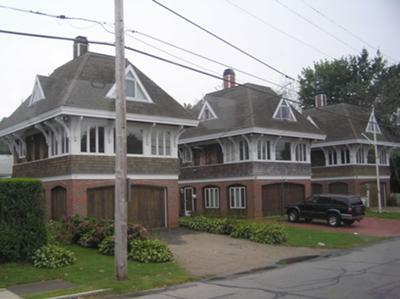 Is there a story about these three identical houses? By the way, I have really enjoyed your site. It has helped be identify a lot of things that I saw while visiting Newport. Thank you! Thanks for sharing that photo Beverly! I know exactly where that is, but I'm not sure about the history. I asked my mother, and she said a childhood friend grew up in the white house behind those 3 (before they were built), and wouldn't have been too happy losing her view to them!